New children’s book advises to be good – but not too good! Sweet Penny and the Lion, the newest book from author-illustrator Richard Fairgray and award-winning composer and musician Alexander Burke, is a funny, subversive picture book about a girl who’s just too good—until she gets eaten by a lion, and something changes when she’s in his very dark belly. Title character Sweet Penny is so good, she would never do anything to disappoint her parents or disrupt class or upset her friends. In fact, she’s so sweet that even when bullies steal her lunch, she just quietly smiles and lets them. One day on the playground, Penny’s class is playing a game when a lion hops over the fence. Penny’s classmates scream and scatter, but Penny was told to stay right where she is. And so she does. And the lion eats her. But something changes when she’s in his very dark belly. She punches and kicks her way out, and when she emerges, not-so-sweet Penny will never be taken advantage of again. 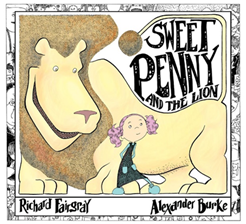 Like an homage to Maurice Sendak’s Pierre, and with just the right amount of cheekiness, Sweet Penny and the Lion appeals to both kids and the parents who will have to reread the book night after night after night. My daughter Olivia is a wonderful child, but she is certainly not Sweet Penny. Olivia has her own mind. Case in point: She’s older than the target group, but I asked her to read it for a child’s perspective. “Can I do it later? I want to finish this You Tube video first,” she responded. I observe Olivia also takes charge in any team she’s working with, very comfortable in delegating assignments to group members. She asked me to volunteer to coach her speech team, and I get to see her style up close. But Olivia later read it, and thought it was cute – particularly the whimsical illustration and the absurd idea of being eaten and regurgitated by a beast. And she knows classmates who are rather docile like that, and thought an empowering message like this could help those school friends break out of their shell to straddle the border between being rule-following yet independent enough to recognize when blind obedience is a detriment. Sweet Penny – helping docile kids find their roar! ← Burgers and Things delivers!